Ask about “basic symptoms.” Even before a patient presents with a first episode of frank psychosis, many will report basic symptoms, which are subtle symptoms such as derealization, depersonalization, feeling existentially vulnerable, and experiencing the body as strange or different. You can elicit some of these symptoms by asking questions such as, “Does the world ever feel strange, unreal, or otherwise changed? Have you ever felt dangerously exposed, or too open or transparent, even though there was no specific reason to feel this way?” In one study of 160 patients with prodromal psychosis, such basic symptoms predicted transition to schizophrenia with a probability of 70% over almost 10 years of follow-up (Klosterkotter J et al, ArchGen Psychiatry 2001;58(2):158–164). 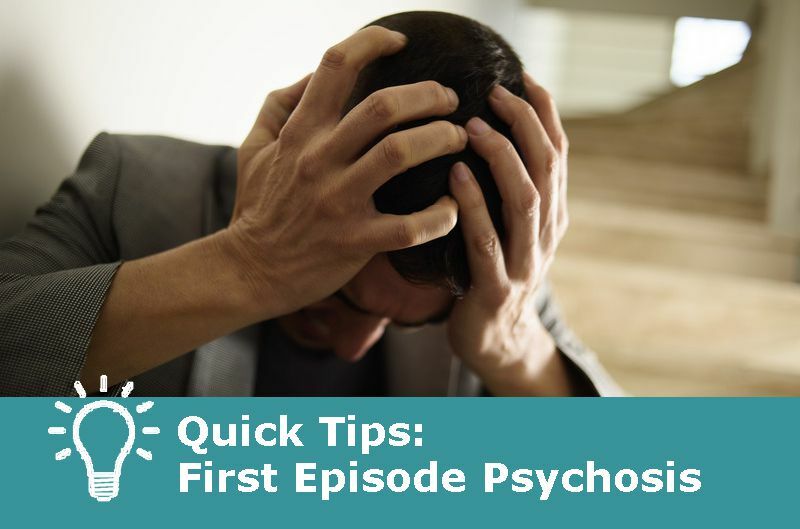 While medications are usually necessary in first episode psychosis, Dr. Shinn recommends using “gentle” pharmacology, meaning the lowest effective dose to minimize risk of side effects. Remember that most first-episode patients are drug-naïve. You want to engage a person in treatment, and not have their first experience with meds be negative. She adds that we know from the CATIE trial that about 75% of patients over an 18-month period stop medications, either because of side effects or because they were not very effective. Remember that medications are important, but not sufficient. A more integrated approach is key. A paper in AJP (Kane JM et al, Am J Psychiatry 2016;173(5):535-536) showed that an integrated team based approach is more effective than treatment as usual. This includes individual therapy, family psychoeducation, and employment and education support—in addition to medication. Traditional treatment approaches focus on symptomatic recovery, using antipsychotics to target positive symptoms. But to really help patients with psychosis get back on track with their lives, we need to do more to help people develop good coping skills and social skills, and help them navigate school, work, and relationships. Dr. Shinn says get your patients involved in shared decision making. Patients (especially younger patients) are more likely to follow through with plans when they have a say.